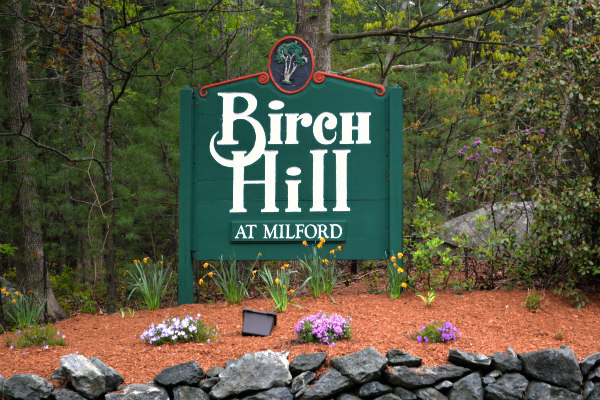 Built in 1990, Birch Hill Condos is a neighborhood of 60 townhouses in Milford, Massachusetts. Each unit in this community has 2 bedrooms, 2-3 bathrooms, a one-car garage, fireplace, and a private deck. Birch Hill Condos is located off of Birch Street on an enclosed circle formed by Waterfall Lane, Lombardi Circle, and Stallbrook Road. Birch Street connects directly to Route 109, which gives drivers access to Route 16 and Interstate 495, making Birch Hill a great location for commuters and travelers alike. Birch Hill Condos is conveniently located just a mile away from downtown Milford, where locals can find anything they’ll ever need. Along E Main Street you’ll find Quarry Square Shopping Center, multiple banks and grocery stores, and Milford’s finest local restaurants such as Pepperoncini’s, SKY Buffet, and Prezo Grille & Bar. A Target, Best Buy, Lowe’s, and Staples are all located on Fortune Boulevard, which intersects E Main Street approximately a mile away from Birch Hill Condos. Those who enjoy fishing and boating can take advantage of the public launch ramp that leads into Milford Pond, where locals report catching a variety of fish including bass, bluegill, and pickerel. Residents of Birch Hill can also hop over to Phase 3 of the Upper Charles Trail for a scenic hike or bike ride.